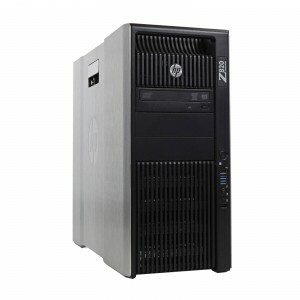 Bargain Hardware is glad to offer one of the most powerful purpose built high-end computing and visualisation workstations on the market, the HP Z820. Demanding graphics and video applications are handled with ease thanks to the Z820s dual CPU capacity which is housed in a fantastic, stylish tool free chassis. The HP Z820 isn't the editing power-house Workstation of choice for media giants like Dream Works for no reason. With it's expandable design, supporting up to two 12 core Intel Xeon E5-2600 V2 Series CPUs and 16 DIMM slots allowing for a massive 512GB of DDR3 ECC 1866Mhz RAM, this system offers something for everyone. Built to harness the power of nVidia Quadro, there are 2 x PCIe (x16) Gen3 slots that will make use of some of the most powerful graphics cards available such as nVidia Maximus cards. The Z820 has 4 internal 3.5” drive bays supporting SAS/SATA Hard drives and Solid State drives using the integrated SATA/SAS controller supporting RAID 0/1/5/10. 4 x USB 3.0 ports, 6 x USB 2.0 ports, 2 x PS/2 ports and twin Gigabit Ethernet ports complete the I/O lineup, and all of this is powered by a huge 1125W 88% efficient wide-ranging, active power factor correcting PSU. Demanding deadlines in design industries are ever present and HP know this. It's not enough to know that your workstation will just run your software, you need a workstation primed for your work. HP ISV certifications with many major applications such as ANSYS, Dassault and AutoDesk ensure that your machine is not just capable of running these applications, but is able to power through every feature available. Here at Bargain Hardware our massive buying power ensures you get the best products for the best prices. We professionally refurbish and check each and every workstation to ensure top quality. Configure your HP Z820 today using our Configure-To- Order options or alternatively, contact our team by using the contact us button.